Elizabeth McDonald, All That Ever Was. Oil, watercolor and ink on canvas, 2015. 109 x 109 in. Elizabeth McDonald is a fascinating artist possessing a mind full of the most wild and esoteric tangents. It’s frightening, fascinating…spastic. Her most recent show, I Only Know Plenty, on view now at Austin’s GrayDuck, is another example of the multimedia and multi-faceted aggregation of work she tends to present, her paintings being, arguably, the strongest expression of her artistic vision. In the GrayDuck show, McDonald pulls from many disciplines to explore the theme of scapegoating and the rituals surrounding blame. The first piece visitors to the gallery encounter is Heart Stream, a multimedia work which takes the artist’s heartbeat, transmits it through a traditional telephone and slows it to a listenable pace. Instead of allowing the piece to remain a simple sound piece, McDonald takes the idea a step further; Heart Stream is a fully interactive installation—two hard back wooden chairs are positioned facing each other with two identical sets of headphones for the purpose of personally engaging with the sound. Since I saw the show on a quiet Saturday afternoon with a friend, we were able to fully participate in the sound installation, just the two of us, watching each other, connected to the heart of the artist— an apropos simulacrum for the exhibition as a whole and a perfect introduction to the rest of the work. 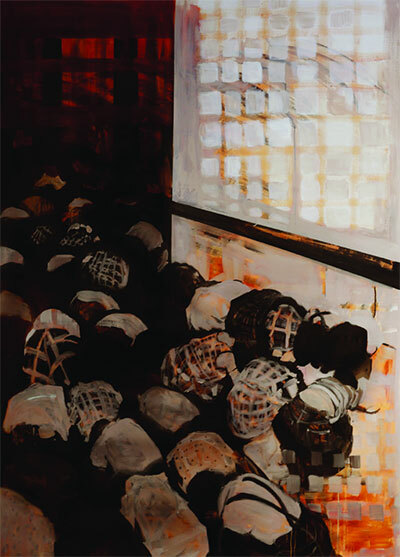 Next one encounters Fear and Trembling, a copper colored gestural painting in McDonald’s usual thin glossy oil, here, depicting so many bodies in traditional Muslim prayer stance, heads touching the ground, spines exposed to God. Or are they crouched in desperate fear of some natural or man-made threat? McDonald tells you nothing but implies much. Fear and Trembling can refer to the fear of God—and the trembling bit is reminiscent of the Shakers and their specific connection to that type of spirituality, but it’s also likely to remind viewers of acts of god, things that ground planes; the terror of nature imposing its will upon the hopeless humanity. Who is the Scapegoat here? God? These people? Nature? Elizabeth McDonald, Hanged Man. Oil and acrylic on linen, 71 x 51 in 2015. 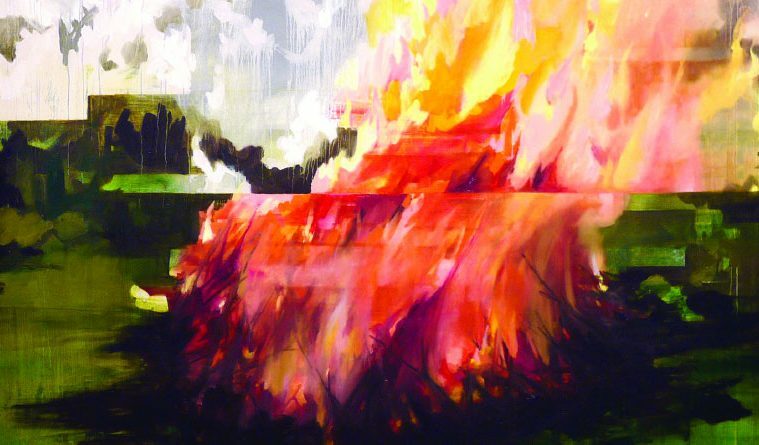 You’re rewarded for turning the corner of the gallery space where gallery visitors encounter four enormous paintings which together consume the back gallery, the best being a larger than life rendering of a fire on a strange split screen. 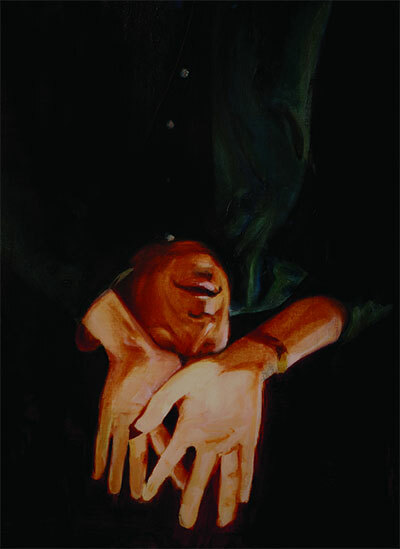 All That Ever Was is a strong and supple painting that draws the eye in with its warmth and color. To its right, The Hanged Man, a troubling upside down man depicted in the richest layers of oils, reveals nothing, but silently pushes one back into that space of trying to discern who the scapegoat is this time. McDonald is a master of the title, she offers what can feel like hints but in reality do more to obscure than enlighten. The sculptural work that resonates strongest is Farmakos, a double-sided pitchfork with a lizard-green handle that dominates the tiny slice of wall it was allotted. Though I find McDonald’s other sculptural works difficult to get into because of their overly pedantic bizarreness, this piece is quiet, threatening and spooky in all the right ways; it’s alarming and yet it’s quiet, a piece about more than bucolic escapism, it’s the tool of Satan, rebels, farmers, and the proletariat. The piece speaks deeply to McDonald’s engagement with a world that internalizes evil and spits it out upon itself. McDonald’s style is plush and rich, easy on the eyes—but the thing about her work that makes it interesting and not just pretty, is the disturbing undertone that beckons an unease that just won’t quit. This show is a special example of having one’s nerves plucked uncomfortably piece to piece, the notion, or illusion, of blame is explored in so many strange and wonderful ways and McDonald’s craftsmanship and prolific mental exploration makes for a show that is both visually, and mentally stimulating. I Only Know Plenty is on View at Grayduck through June 21, 2015 during gallery hours Thur-Sat 11-6pm & Sun 12-5pm.